Justine and Olivia Moore like to introduce themselves together, otherwise, it can be a little confusing. They live together in an apartment in Menlo Park. They share clothes. They both wear Rothy’s sustainable ballet flats and are big fans of Glossier. Their desks are only inches apart, because yes, they work together too — and because they share a space heater. The 24-year-old identical twins are venture investors at CRV, a Palo Alto-based venture capital firm they joined a little over a year ago. They call themselves The Venture Twins and they may just be the nearly 50-year-old firm’s secret weapon. CRV hired Justine and Olivia to work under Saar Gur, a general partner responsible for leading deals in Bird, DoorDash, Patreon, Dropbox and ClassPass, in 2017. He was looking to expand CRV’s consumer team when he found Justine, a recent Stanford economics graduate who was finishing a year-long stint at Goldman Sachs. It wasn’t long before Justine’s references were urging Saar to hire her twin sister, too. “They are such a good team;” “You should hire both of them;” “They work great together,” they’d tell him. The Portland natives have an impressive resume. At Stanford, they launched Cardinal Ventures, a first-of-its-kind on-campus startup incubator. Plus, one might say they were bred for venture capital. Their mother, Darcy Moore, was also a VC. She retired when they were just five years old, but the pair remember walking into pitch meetings and observing demo days before starting kindergarten. “The cool thing to say is ‘oh, I never wanted to be in venture; I stumbled into it,’ but we have always wanted to be in venture,” Justine told TechCrunch. Despite long-held ambitions to become venture capitalists, Justine and Olivia enrolled at Stanford in 2012 to study journalism. After some time on The Stanford Daily covering the entrepreneurship beat, they realized journalism wasn’t going to quench their thirst for innovation. Their junior year, they created Cardinal Ventures. The program gives two cohorts of 12 to 20 startups per year $5,000 in non-dilutive capital and supports them with 10 weeks of mentorship and programming. For the twins, Cardinal granted them access to some of Silicon Valley’s best investors. Justine (left) and her twin sister Olivia are venture investors at CRV. By their senior year, they were fielding internship offers from those top-notch VCs. Olivia accepted an internship at First Round Capital, while Justine went to work at Cowboy Ventures. After graduation, they both went to work as analysts at Goldman. 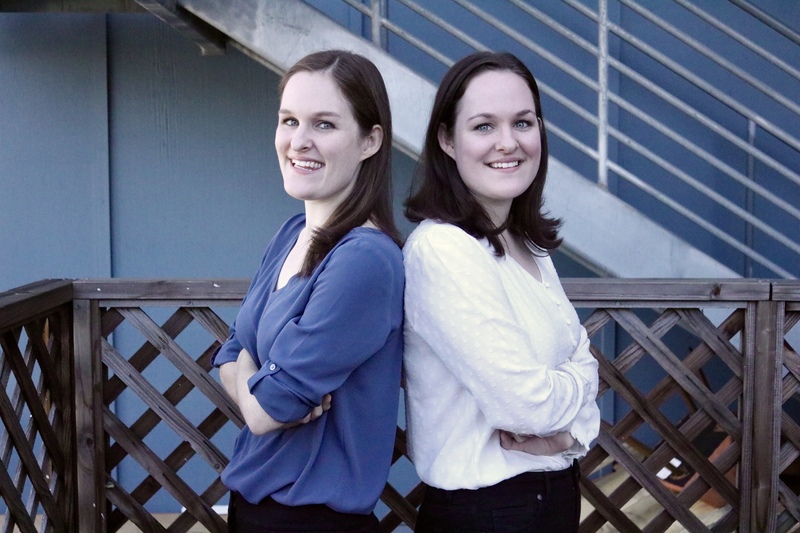 After one year on the public equities team for Olivia and the private equities team for Justine, the twins were ready to transition into venture for good. They had met with CRV’s partners during their Cardinal Ventures days and felt the opportunity to work with Gur on consumer tech investing was something they couldn’t pass up. That, and the firm was willing to give them the freedom they needed to build their personal brand. 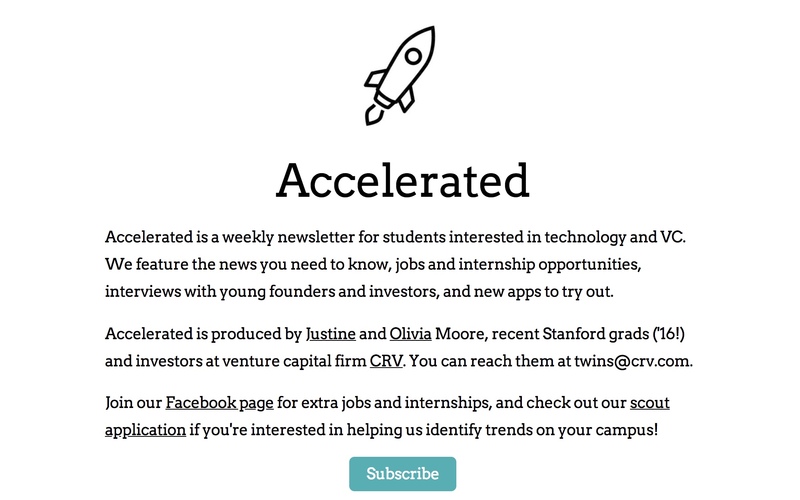 In addition to their Twitter account, @VentureTwins, and a very active Medium page, Justine and Olivia have a weekly newsletter called Accelerated that’s racked up some 5,200 subscribers since it launched one year ago. The newsletter is written for college students. It provides the week’s biggest news in tech, notable internship and job openings, recommended reads and surveys on industry topics and trends for readers to complete. Accelerated has a team of 120 campus ambassadors who Justine and Olivia can text at any time to ask about various topics. “Do you like this company?” “Have you ever heard of this product?” Things like that. So far, the Accelerated network has helped the twins source five potential deals, two of which became CRV portfolio companies. That’s Harper Wilde, a direct-to-consumer bra retailer, and Uppercase, which helps D2C companies open brick-and-mortar stores. CRV isn’t known for its D2C investments; in fact, Harper Wilde was its first ever. With their instincts, youth and network, the twins have quickly proved their value to the firm. At this point, you’re probably wondering how two 24-year-old siblings can live and work together and not want to kill each other. And it may sound too cutesy and convenient, but they think they’re better together. The twins plan to stick together, though it’s not necessarily a requirement. For now, they’ll be keeping their residence in Menlo Park, where they have the space to dog-sit former 23andMe president Andy Page’s Bernedoodle. In 20 years, who knows, maybe Justine and Olivia will be known as some of the greatest consumer VCs the industry has ever seen. They are smart, refreshingly modest and they seem to know their stuff. “We’d love to be doing this in the long term if we’re good at it,” Justine said.